This applet models the hypergeometric distribution, which can be used in quality control when there is no replacement. Move the sliders to change population, number of known defectives and sample size, then observe the resulting probability distribution. 1. Can you find some combinations of N, D and n that give a probability of 1 for some x value? Can you explain why this would be the case? 2. 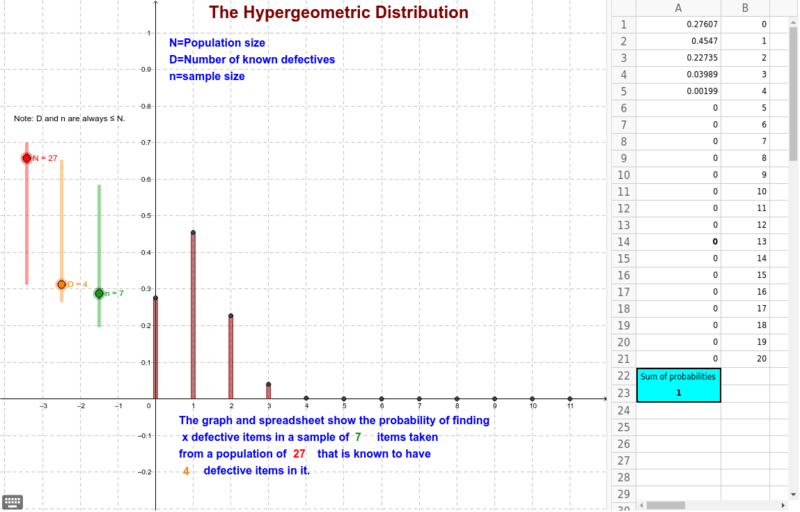 What combinations of N, D and n produce symmetrical or near symmetrical distributions? Why would this be the case? 3. Do you find any combinations for which the sum of the probabilities is not equal to 1? (Check the spreadsheet.) 4. This graph shows the probabilities using bars arranged along the x axis. Would it make sense to connect the bars and so make a smooth curve?